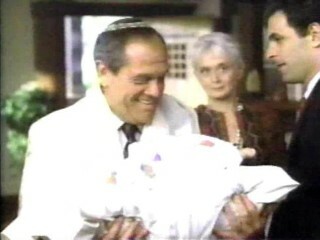 Season Four: "prelude to a bris"
Episode 401--"prelude to a bris"
Hope and Michael's son Leo is born and Michael wrestles with his Jewish heritage and the issue of circumcision. Hope gives birth to Leo (not seen, just sound over the black screen as credits roll), and almost immediately the matter of a bris (a circumcision ceremony) comes up. Michael's mother, Barbara, comes to visit and unexpectedly brings a friend, Ben Teitleman. Michael doesn't seem to take to Ben right away, despite how happy Hope is about it. Over dinner, Ben tries hard to be sociable and offers the history of the Caesar salad, which everyone else finds interesting but Michael. Ben then offers to get them all house seats to Phantom of the Opera, and since Hope can't go, she insists that Michael go with Ben and Barbara. Somehow a brunch is arranged with Melissa for the next day. During preparations, everyone keeps pestering Michael about the bris and giving him advice on which kind of mohel to get to conduct it. Everyone goes to the museum of science and have little conversations while walking through the model of a heart. The men and women then separately discuss their notions of circumcision, the men while jogging, the women while in the kitchen. Barbara, Ben, and Janey stop by work unexpectedly and tap into Michael's stress and frustrations. Michael tries to talk to Hope about whether they should have a bris or not and she finally expresses some of her confusion as to why they should have one at all since Michael's religion doesn't seem to mean that much to him most of the time. While working on stuff at D.A.A. with Elliot, Melissa stops by with pictures of Leo and other old photos of their ancestors. Michael gets a message that a rabbi has stopped by to see Michael, and Melissa encourages him to go talk to him. Michael rapidly figures out that Ben has sent the rabbi, but manages to stay civil while ushering him out. Hope and Barbara talk about the pros and cons, which leads to Hope sniffling a little, asking what the meaning of the ceremony would be for them and the baby. When everyone converges at home, Michael pulls Ben aside and tells him bluntly that it was out of line to send a rabbi without asking first. Upstairs, Michael and Hope finally have it out and argue quite bitterly about Ben's role, how Michael is uncomfortable with his own Jewishness. Michael follows Hope out into the rain and they end up sitting in the car, Hope asking what the ceremony would mean for all of them. Michael returns inside, trying to talk to his mother and discussing how she's happy with Ben and it's not Michael's job to take care of her anymore. Michael and Ben talk at the deserted office before Ben goes to the airport, trying to apologize for having yelled at Ben the other day. Michael returns home and has a vision of Leo as a teenager, rushing out the door to play ball on his thirteenth birthday (no bar mitzvah). Hope comes down the stairs with Leo and he talks to her about how he was expecting her to fight him about the bris, but actually he hasn't worked it through for himself yet and that's the real conflict. They call up the rabbi who visited Michael earlier to discuss the ceremony and the difficulties they will have in the future as a mixed faith couple. On Monday at the bris, Gary has been selected to hold the child and seems sort of nervous about it. Ben shows up suddenly and Michael makes a quick switch, asking Ben to hold Leo instead, and everyone seems very happy about the arrangement. Melissa says that Michael's father left when Michael was about 15--why the changing dates? Why did Michael dress up in a suit to go into the office on a weekend? He often is shown in casual clothes at such time. Nancy still has her long hair. All the guys at the bris wear yarmulkes. "You know I've read somewhere that if men practice, they can actually breast feed. Isn't that interesting?" --Hope, in the middle of the night. Why does every member of the show get Dr. Karen Silverman when they go into the hospital? Nancy had her for the cancer and the surgery and then she delivered both Emma and Leo. A cancer surgeon and an ob-gyn all in one package? Ben was flying back to Chicago on either Saturday or Sunday (it looked like Saturday) so why did he suddenly show up at a bris on Monday back in Philadelphia? This makes absolutely no sense at all. The continuity of Ben's appearances in and out of the house was choppy and hard to follow.